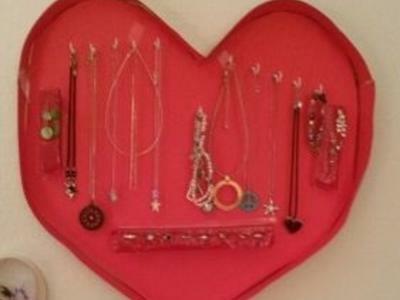 HIDDEN JEWELS IS A DECOR PIECE AS WELL AS WELL AS A JEWELRY ORGANIZER. One way it is used is that women love to be able to see all their jewelry in one overview to decide what pieces would complement their clothing selection for the day. Another benefit is that Hidden Jewels will de clutters all their jewelry pieces and organizes them in one place. Briefly stated, my invention comprises a unique design that is heart shaped and is enclosed with either a hinged cover or a cover that slides on with a dowel and hole hardware. The hearts can vary in size (From 12,16, 20 to 24") with one serving as a ring holder, one for necklaces and bracelets and the other for earrings (as In a "Trio of hearts). The largest one can hold your entire collection of jewelry. Each piece will have a picture framing hardware and interior will be designed with appropriate hardware for jewelry to be arranged and organized. The unique features of my invention are the love of hearts and that the jewels will be enclosed inside the heart shaped wall piece. I have filed for provisional patent & am going to use this money to file utility patent. Next step will be to manufacture and then begin marketing process. My goal is to find someone to license this product! !